I went to the doctor on Monday and got great news. Everything looks good with my pregnancy. She has my c-section scheduled for June 18th at noon. Wow, only 6 more days!! We are all anxious to meet Trent. Spencer went last night to Build-a-Bear to make a monkey for Trent. He had to get his monkey some pj's and a pacifier. He is planning to take it to the hospital and give it to Trent when he meets him. Spencer has the same monkey and wanted his brother to have one, too. How fun! We enjoyed visiting with y'all on Monday. 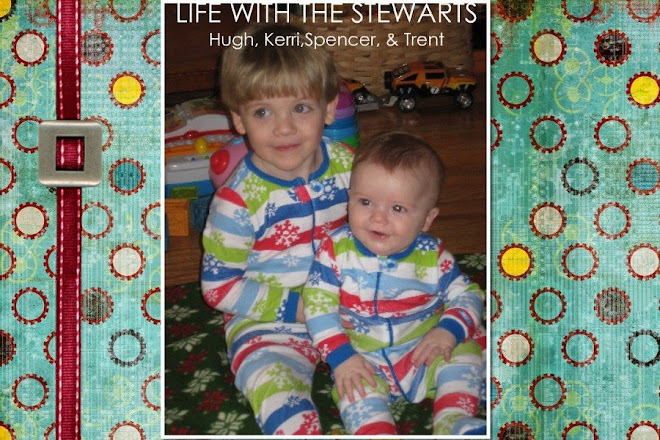 I have some cute pictures of Spenceer holding Matthew that I will send you. Spencer is going to be a good big brother. He was so sweet and gentle with Matthew. congrats kerri! your family is precious. i will pray as i think about you tomorrow. Hey Kerri! My dad just sent me your blog. Congrats on Trent's birth. I hope you're all doing well! Found your blog through Facebook and was ecstatic! Now I get to keep up with the goings on in the Stewart family! I've got to get one of these things going for the fam soon. Congrats on number 2 on the way! Look forward to hearing all about the adventure! Hey Kerri. I found your blog from Lauren's. I know you are so excited to be having Trent so soon. Thank the Lord you don't have to endure the rest of the summer; it is already sooooo hot!